Lama Pema Dorje Rinpoche (1942-2018) was born into a yogi family named Jova, whose ancestors can be traced back to Milarepa's paternal line. His father, Kathok Rigdzin Dorje Rinpoche, was a disciple of Taklung Gangshar Rinpoche and Taklung Chodung Rinpoche. From these two teachers, Rinpoche received the entire Longchen Nyingtik teachings, as well as the Machik Labdrön chö teachings. When he was twenty, he went to Mount Kailash for an extended retreat. After that he met Golok Serta Rinpoche, a lineage holder of the first Dudjom Lingpa's treasure teachings, from whom he received the main Tröma Nakmo practice which he continues to practise today. Afterward, he became a follower of the Dudjom Tersar lineage. It is said that once, Lama Pema Dorje's mother dreamed of a clear and brilliant crystal pillar. At the same time her mind felt very pleasurable and her body felt great bliss. When she mentioned this dream to her husband, he said that this was a sign that they had conceived a boy. Therefore he gave the unborn infant a male name, Phagpa Dorje. Although some thought it might be a girl, he assured them it was a boy, which would be proven at childbirth. 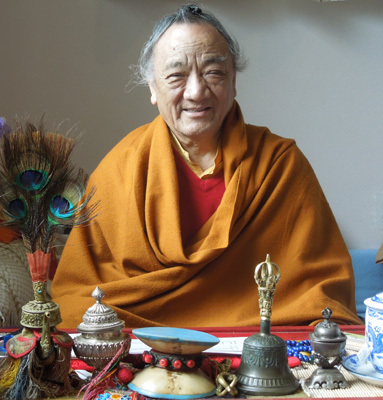 Lama Pema Dorje was accordingly born in 1942 on the banks of the Ganges River in Rishi Kesh, India. The infant was draped over by a long placenta, looking like he was wearing a meditation belt, which was considered a very auspicious sign. During childhood, Lama Pema Dorje always liked to be naked, disliking wearing clothes. He couldn't eat meat and also was disgusted by jerky hung in the house. Oral stories recounts that the first language spoken by the infant was Sanskrit and mantra sounds. This made him very different from other Tibetan children, and people didn't know if this was a good or bad sign. When Lama Pema Dorje was four years old, his father consulted with his guru, Golok Serta Rinpoche, who confirmed this as a good sign and said: "Your son is the reincarnation of an accomplished Indian Acharya." He then bestowed refuge vows on the boy and gave him a statue of Buddha Shakyamuni and a picture of a white umbrella, as a sign of his future activities to benefit beings. At this time he gave him the title of Acharya Tulku Pema Dorje. Later, when he was 21, Lama Pema Dorje Rinpoche was recognized by Chatral Rinpoche as the reincarnation of the Indian Mahasiddha Padampa Sangye . At the age of 4, Lama Pema Dorje started his Buddhist education under the instruction of Gokok Serta Rinpoche. He received from him the Dudjom Lingpa lineage upper tradition of the Namkha Khyung Dzong teachings, including Tröma Nakmo ngöndro and the Zabsang Khandro Nyingtik ngöndro, which is the main ngöndro of this terma cycle. At this time, he also received the short Dudjom Tersar Ngöndro, the Tröma Nakmo Chö initiation and the Chö main teachings as well as Nyen Sa, Nang Jang and Phowa. All of these teachings were from the Dudjom Töluk, the upper tradition of Dudjom Lingpa, and Lama Pema Dorje received these teachings twice. He finished the three ngöndro practices and continued to practice all of these teachings. Between the age of 12 and 14, he completed guru yoga and the Tröma Nakmo main development stage at Pema Chodzong. At age 15, he studied with Gen Rigsang Dorje Rinpoche, a senior disciple of Dudjom Rinpoche. From him, he received the Tsokye Tuktik, the Khandro Tuktik, and the Vajrakilaya Namchak Pudri and Pudri Rekpung teachings as well as Dorje Sempa teachings. All these teachings included empowerment, lung, and practice instruction. At the age of 17, Lama Pema Dorje went to India and met for the time Dudjom Rinpoche, who accepted him as his student. Dudjom Rinpoche gave gim many initiations and lungs, covering all the teachings of Dudjom Lingpa and all his own teachings, as well as many Nyingma teachings. These teachings included the Nyingma Kama and Nyingma Gyübum. At the age of 18 Lama Pema Dorje Rinpoche did an intensive practice with Dudjom Rinpoche during which he received mind transmission, individual instructions, and personal interviews. Lama Pema Dorje Rinpoche once said that he considered "this time spent with Dudjom Rinpoche as the best time of his life". Afterwards, Lama Pema Dorje Rinpoche was able to learn Rigdzin Sokdrup tsa-lung and tummo practice from Kunzang Dorje Rinpoche, under the permission of Dudjom Rinpoche. This study included rare teachings. Kunzang Dorje Rinpoche also gave him teachings on the Northern Treasure Phagmo Sabga tsa lung cycle and afterwards taught Rinpoche the Jatsön Nyingpo Three Roots initiation and main completion practice, and Dzogchen Three Realm Liberation practice. He also studied with the Bhutanese mantrayana master Pema Wangchen Rinpoche, who was also a Dudjom tsalung lineage holder. From this teacher he received all the Dudjom Tersar lineage tsa lung and Tummo teachings, which included the complete five-branch practice including the Six Yogas, which covered the outer, inner, and secret teachings. From Neten Chokling Pema Gyurme, he received the Chokling Tersar initiations and lung. From Chatral Rinpoche he received the Guhyagarbha and many other teachings. From Jamtrul Rinpoche he received the teachings of Shantideva's Bodhicharyavatara. From Lama Sherap Dorje Rinpoche, he received many initiations, lungs, teachings and advices. From Dilgo Khyentse Rinpoche, he received all the Nyingma Treasures, many other teachings, advices and personal instructions. From Thinley Norbu Rinpoche, he received the Three Roots initiation as well as instruction and advice on Nang Jang and many Dzogchen teachings. From Chagdud Tulku Rinpoche he received the Orgyen Thinley Lingpa treasures, Red Tara initiation and Kurukulle initiation. He also received Longchen Nyingtik Yeshe Lama Dzogchen teachings, as well as Chagdud Rinpoche's own pure vision mind treasure, Green Tara Nortreng (Jewel Mala) initiation, teaching and instructions. From Penor Rinpoche he received the Nyingtik Yabshyi and Kalachakra initiations, as well as many other initiations and teachings. From Khetsun Sangpo Rinpoche, he received the Yangtig Nagpo Golden One Syllable teachings, the Trulshik Dongak Lingpa treasure, including the Three Roots and 100 Deities initiations. The culmination of these teachings included a seven-day dark retreat in total darkness. From his uncle Kyangchak Rinpoche, he received many oral teachings and inner teachings of Dzogchen. From Minling Trichen Rinpoche, Dodrupchen Rinpoche, Chatral Rinpoche, Taklung Tsetrul Rinpoche and from several hidden yogis, he received many additional teachings. In addition to extensive connections within the Nyingma lineage, Lama Pema Dorje Rinpoche also received many teachings and transmission from such teachers as Karmapa Rangjung Rigpé Dorje, H.H. the Fourteenth Dalai Lama Tenzin Gyatso, Sakya Trizin, Taklung Matrul Rinpoche and Sakya Chogyed Rinpoche. For many years, Lama Pema Dorje Rinpoche spent most of his time practising, not teaching, except to a few fellow practitioners at the explicit request of his own teacher. He practised mainly the outer development stage of mahayoga, the Three Roots, and the inner completion cycle of anuyoga focusing on the prana, nadi and bindu. Lama Pema Dorje Rinpoche was recognized by many as a main lineage holder on the practices of tummo and the five-branch yoga. Then, on 20 March 1991, Dilgo Khyentse authorized and encouraged him to spread the Dharma. Once of the first master to invitate him to his Dharma center to teach was Chagdud Tulku Rinpoche. Then, other lamas like Kunzang Dorje Rinpoche, Kyangchak Rinpoche as well as Shiva Rinpoche (the reincarnation of his first teacher Golok Serta Rinpoche) also encouraged and authorized him to teach. Lama Pema Dorje Rinpoche then started teaching in Tibet, America, Brazil, Taiwan and Japan. Lama Pema Dorje Rinpoche traveled extensively. He had a wife, Khandro Kunsang Chozom, three sons and one daughter. His wife's father, Uthog Tsomchung Rinpoche, is a Longchen Nyingthik lineage holder. The family of her mother, Choje Zangmo, is from the Drikung Kagyü tradition. Lama Pema Dorje Rinpoche passed into parinirvana on July 5th 2018 at his home in Oakland, California, surrounded by his family. Lama Pema Dorje Rinpoche gave instructions on the care of his kudung, to be done immediately following his passing, to Khandro Kunsang Chozom and she followed them precisely. This page was last edited on 27 December 2018, at 09:38.